It has been a tedious task to transfer a huge number of records be it any medium. You can’t send folders to anyone via email attachments or any other online sending medium. Even if you sometimes do, these files consume vast amounts of data and space over your cloud storages. If you feel a few files are necessary, you don’t want to delete them & still you need them on your PC then file compression software are a solution. File compression software not only eases our task of sending the files, protecting them but also it saves us disk space and data. Here we present you a few good File Compression software for PC. Whenever you talk about the best file compression software available, this one always is there in the list. No doubt it is one of the excellent file compression software available for the Windows PC. It’s a paid software which is available with a 30-day free trial license after that you need to buy the license key which you can easily download from the official website. It supports a broad range of compression formats and methods which account to more than 50 formats altogether. It also repairs your damaged archives and has a similar version for MAC as well. If you want to pay a bit and want the best, this one suits your needs. It’s a free and an open source alternative for the WinRAR. Similar to its competitor this software compresses your files quickly while supporting a broad range of compression formats and methods. One of the most widely used open-source software is available for MAC and Linux too. It supports over 87 languages and is a powerful software with plugin supports that might suit your needs. This software again comes from the world of open source. It’s based on the source that was used to make 7-ZIP. This software works as a file manager as its competitors but also provides some features like finding duplicate files, basic editing tools for images, optimization of the graphic file compressions and much more. It also supports the broad range of compression formats and is available across all major PC platforms like MAC and Linux along with Windows. This software is a powerful extraction and compression tool for zipping and rar type formats. It’s a free product that you can download from its website. Hamster Free Zip Archiver claims that it’s 2x faster than standard software available for compression in the market. This one is a kind of attractive UI which makes it different from its competitors. You can just drag and drop your files and folders into is User window and choose the compression options to compress your records. It’s a fast, decent looking and a good software to suit your needs. This software was once a shareware that is now available for free to download. Supporting versions of Windows up to Windows seven both 32 and 64-bit versions this software is yet another powerful and efficient file compression and extraction tool. It has its EGG extension format for compression that allows large files quickly and supports a broad range of platforms & UNICODE format. Not diving into much technicalities this software can support 40+ different zip file archives and other special formats as well. It’s a simple to use and a fast archiver which supports major platforms like Windows, Mac, Linux and Android as well. It’s a simple software that can only archive in .ZIP or its B1 source format. But it can extract over more than 30 formats including the other open source formats. The website supports online unarchiver if you don’t want to wish to install it but just use it for a while. It’s a free software and a simple one available across major platforms. It is another powerful compression tool that you can use for free for your systems. It supports a broad range of file compression formats both for extraction and compression. It’s a simple UI allows you to drag and drop files for easy compression. It also allows you to work with ISO images and it provides 256-bit security encryption as well. It’s a freeware that can also be used for commercial purposes, supporting over 20 file formats including the core ones like RAR, WAR, ZOP, 7ZIP, ISO, NRG and much more. It provides encryption for the files with 128-bit encryption. It can also czip encryption to provide the protection from unwanted access to your archives. It’s a straightforward and great utility that you can install on your system. It’s one of the most popularly used software for compressing and archiving files. You can download it from its official site for free, yes it’s a free software that you can use on your MAC, Windows and Linux systems. It’s a simple to use utility that comes with an attractive UI where you can drag and drop your files to compress and archive. It supports most of the popular formats and is a lightweight tool that can be on the system. This is a paid software which is popular amongst the users for commercial usage. It supports both windows and mac pcs. It’s a powerful tool which allows you to search through the archived files also enabling you to set a different password for each file. It supports a broad range of formats and can convert ISO file into a CD image and vice versa. 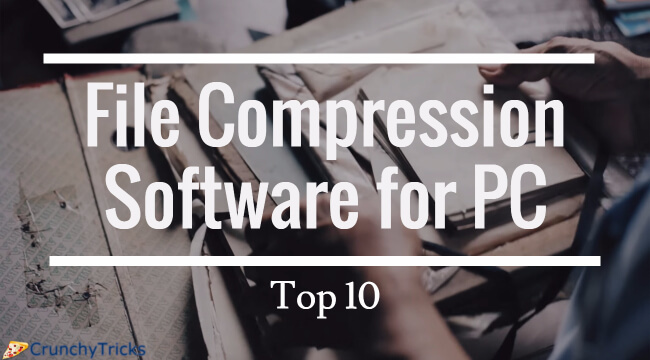 So it was the list of top 10 best file compression tools including both the free and paid versions that you can use for personal as well as commercial purposes. Next articleAdidas Snapshot: Aplikasi Sepakbola Pengasah Skill!